This delicious sauce has one of the worst names ever – so why is it called the Monkey Gland Sauce? In times when the sauce was created, there has been much speculation in the media regarding the use of monkey glands as a youth prolongation agents. Despite the name, the sauce does not involve monkeys organs in any way. Instead, it is made up of chopped onion, garlic and ginger, with a combination of chutney, soy sauce, mustard, Worcestershire sauce, ketchup, and wine (or whisky/cognac). The Monkey Gland Steak was created at the Savoy Hotel in London. It all happened when the Russian-born French scientist, Dr Serge Voronoff (1866-1951), caused a sensation by grafting monkey testicle tissue onto the testicles of men, believing that this was an effective treatment to induce rejuvenation. The first such transplant, in 1920, appeared to be so successful that Voronoff could not cope with the demand from men hoping to regain their virility. Three years after introducing his monkey gland treatment, Voronoff was hailed by 700 of the world's leading surgeons at an International Congress in London - for his revolutionary discovery of how to reverse the ageing process. Voronoff regularly visited the Savoy Hotel in London, and his medical experiments led to the naming of a new dish, flamed with brandy, by the Italian master. One of the waiters at the Savoy Hotel - Cavaliere Fiorino Luigi Bagatta – had brought the Monkey Gland Steak recipe to South Africa in 1935 and had introduced the dish to the diners at the old Carlton Hotel. 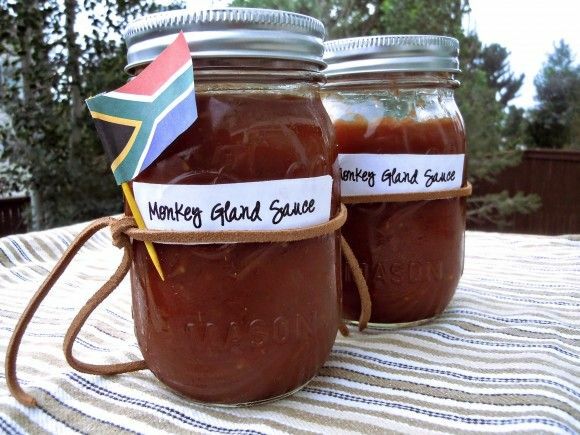 This was the beginning for Monkey Gland sauce in South Africa. Monkey gland sauce works with practically every type of meat, it is quick and easy to prepare and keeps for about two weeks in the fridge. Mix all of the ingredients together in a large saucepan taking care to ensure the chopped tomatoes are finely chopped. If need be drained off the juice and chop them finely by hand. Start cooking the sauce on a medium heat until all the mix thickens, turn down the heat and allow to simmer for a further 10-15 minutes until nice and thick. This sauce can be used immediately making it very practical for those last minute barbeques or can be bottled and kept in the fridge for about 2 weeks. To say that Monkey gland sauce is good doesn’t do it justice. It’s fantastic, it rocked our world. Have a safe, fun, and happy grilling! Enjoy!